Vintage - Royal Vale Bone China, by Adderley, in the "Gold Chintz" Pattern, 18-Pieces, Circa 1913-1947. 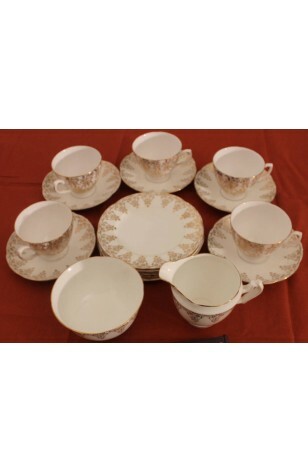 Royal Vale "Gold Chintz" Tea Set, Service for (5) with Cream & Sugar, plus and Extra Tea Plate. This is a White Background, with 22kt Gold Floral Filigree. A Striking 22kt Gold and White Tea Set having no visible chips or crazing, other then noted below. The 22kt Gold on Rims, Feet and Handles is all intact. Plates and Cups are Scalloped. Royal Vale "Gold Chintz" Tea Set, Service for (5) with Cream & Sugar, plus and Extra Tea Plate. This is a White Background, with 22kt Gold Floral Filigree. A Striking 22kt Gold and White Tea Set having no visible chips or crazing, other then noted below. The 22kt Gold on Rims, Feet and Handles is all intact. Plates and Cups are Scalloped. In Good Resale Condition, unless noted below or in pictures. 5 - Saucers - 5 3/4"